Most people are familiar with the Thoroughbred horse because they are the most common breed used in flat racing in North America. But, Thoroughbreds are a multi-purpose horse, and many off the track Thoroughbreds or OTTBs find second careers as riding or driving horses. Some Thoroughbreds are bred specifically as riding horses or are used to raise various crosses such as draft crosses, or sport horses. While they were developed from a number of horse breeds, they are often used to improve other breeds like Quarter Horses that are used for racing. The Thoroughbred typically has a deep chest, lean body, and long flat muscles. They are fine to medium boned. They have well-angled shoulders and lean but powerful haunches. There is no actual breed standard for racing Thoroughbreds as there is with the Arabian or Morgan, as their primary purpose is racing at speed, not as specimens of conformation and conforming to a certain type. Despite this, most TBs are recognizable for their powerful and athletic body type. The Thoroughbred can range in height from 15HH to over 17HH. Again, there is no breed standard. However, most tend to be in the 15.3 to 16 hand range. Primarily bred as a racehorse, Thoroughbreds are also used in many English disciplines such as jumping, dressage, and hunting. Many Thoroughbreds are now being bred as riding horses only. In addition to jumping sports and dressage, many are used as trail horses, others as pleasure driving horses. Many former racehorses also known as off-the-track Thoroughbreds or OTTBs, move on to a second career as riding and driving horses. The breed is often used to add refinement and athleticism to many ponies, warmblood and draft horse breeds. Many sport horses have Thoroughbreds in their ancestry. Thoroughbred Arabian crosses are called Anglo-Arabs. They are not just ridden. 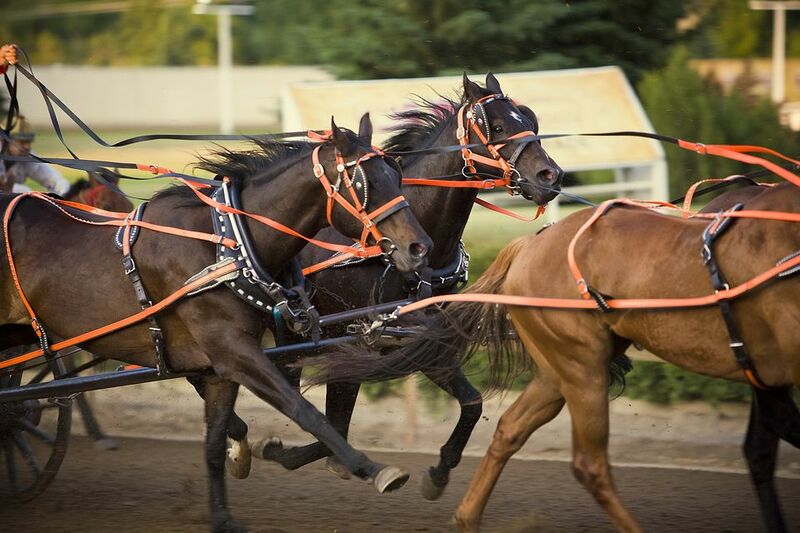 The sport of chuckwagon racing uses many off-the-track Thoroughbreds in teams. Thoroughbreds come in every solid color, including gray and more rarely, roan. White markings such as stars, blazes, stockings, and socks are common although many are very dark and plain, with few white markings. The predominant color is dark brown or bay. There are few pinto Thoroughbred horses, as well as cremmelo and palomino. The breed originated in seventeenth-century Britain. Pedigrees of Thoroughbreds are carefully documented and most trace their ancestry to one of the original British owned foundation stallions: The Byerly Turk, the Darley Arabian, and the Godolphin Arabian (named for their owners—a previously common practice). Bred to native racing stock, they produced offspring that were fleet, strong and of a consistent type. Deep wide chest provides lots of room for lungs and heart. TBs excel in other sports besides racing. Many horses ridden in Grand Prix and Olympic dressage, jumping and eventing have been TBs or part TBs. Laudanum was a French stallion who won at Grand Prix jumping as well as puissance. Puissance means ‘power’ and is a high jumping competition. Laudanum sired many Grand Prix level jumpers. Ladykiller is a stallion that was unsuccessful on the track but bred to Holsteiner Warmbloods added refinement and athleticism. He is regarded as an important sire of sporthorses. Thoroughbreds have been bred to be fast, athletic and spirited. They don't always make the best beginner horses. For the intermediate and advanced rider, who can channel their energy they are the ultimate ride with smooth flowing gaits and powerful athleticism. There are always exceptions to the rule however and many a seasoned and patient schoolmaster was once a potential track star. TBs who once raced but are now riding horses are called OTTBs or off-the-track-thoroughbreds.